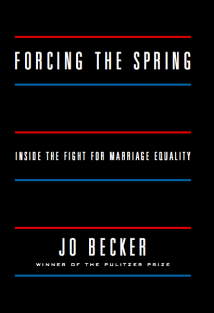 In her forthcoming book, Forcing the Spring, New York Time’s Pulitzer-Prize-winning investigative journalist Jo Becker details behind-the-scenes accounts of AFER’s fight against Proposition 8. Today, The Washington Post and Associated Press exposed Becker’s breaking story of how Ashley, the daughter of Prop.8 lawyer Chuck Cooper, came out to him midway through trial. It had been midway through the case, during the interminable Ninth Circuit phase, when his wife confirmed what he had suspected for months. Debbie Cooper had known, even before her husband agreed to take the Proposition 8 case, that her daughter was a lesbian. Cooper, who had married Ashley’s mother when Ashley was just seven, accepted it without question. Ashley is engaged to her fiancé, Casey, and will be married this summer. Click here for more information on Forcing the Spring.